Practice shapes with your preschooler with these Preschool Shapes Mats from Beth at Preschool Play & Learn! These sheets are adorable, so print them in color! Laminate them for reuse as well. 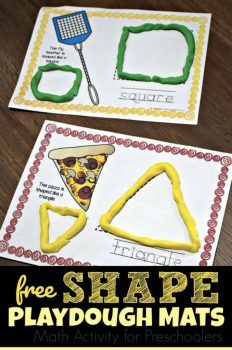 There are 9 pages of shape mats, and on each one, there are 2 places to create the shape with playdough, a space to trace the shape word, and an image of a real-world object that matches that shape. It’s perfect for learning shape words, fine motor skills, and acquiring some new vocab! Grab these Preschool Shapes Mats here!